I have completely redone my Bellatrix Lestrange from sim from Harry Potter and the Order of the Phoenix- new dress mesh, new textures, new hair, new jewelry, new makeup, most everything. Of course, none of these amazing meshes are by me, simply the textures (except for the hair, which is 100% WickedSims). New pictures and thus new information of the Bellatrix outfit have made me able to create a texture for Bellatrix as close as I can. I recoloured the Kittyvibe skintone so that it now includes a dark mark (the skin texture is still hers). The jewelry features her necklace, earrings, and one of her rings. Her boots are now visible behind the shagged hem of her dress. The sims does not quite look like Helena Bonham Carter, but I tried. You have done a wonderful job on her ;-) I really love that outfit too. Thank you! 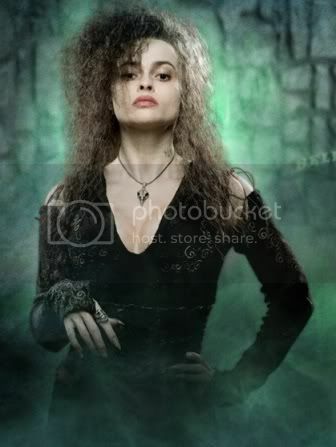 What a super version of Bellatrix!! It looks just like her. Thanks. Absolutely fantastic! It looks so much like her.. Thankyou! Thank y'all so much! I'm glad you like her. She's so cool. Thanks for Bellatrix. I've tried her today, she looks really good in game. Thanks for sharing and making her, I love Bellatrix! I hate the evil, wicked character but I love the sim resemblence to the character. She looks awesome. I'm forbidden by my sister to download HP sims, but I think Im going to ignore that for now, Bellatrix looks entirely to perfect to pass up!